Baseball America named its 2010 Minor League Player of the Year on Tuesday afternoon. Prospectors had been waiting on this announcement for a few days. 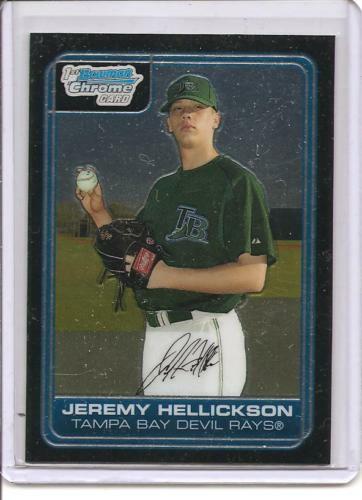 Speculation gave it to a few big hitters, but the BA editors chose Tampa Bay’s Jeremy Hellickson , who went 6-1 with a 2,59 ERA in Triple-A this season. Hellickson is the third Rays player in the last decade to receive the honor joining Rocco Baldelli in 2002 and Delmon Young in 2005. Atlanta Braves’ Jason Heyward was last year’s winner. Here’s Baseball American’s article on Hellickson. They also had a discussion regarding their pick. An award like this gives recognition to a player that many casual baseball fans may not know about. Hellickson did come up this year and in three games went 3-0 with a 2.57 ERA for Tampa. He has struck out 26 in 28 innings and has a .964 WHIP. On eBay, the award is already noticeable. A week ago, his 2006 Bowman Chrome Xfractor sold for under $40 and often times under $30. On the day of his announcement, the same card sold for $50. His 2006 Bowman Chrome card is his most popular. But his announcement didn’t mean an influx of his cards on eBay. Of the 162 Hellickson listings, just five of them were put on the day he won Baseball America’s Minor League Player of the Year. The final three came down to Hellickson, Dom Brown and Wil Myers . Who was your MILB player of the year? Look forward to watching this kid pitch for years to come.